Have you ever felt like this poor Boxer in the picture when you have received a rejection or listened to criticism on your work or read a bad review about your book? I know I have. But what do you think this dog is going to do in an hour or two? Still look defeated and like he lost his best friend? No way! If you know anything about Boxers, he'll be wagging his tail and chasing a ball. Who knew we could learn an important lesson from a dog? I attended the Missouri Writers' Guild conference this weekend and part of the program was called, "First Reads." This is where one to two pages of a conference attendee's manuscript is read aloud (anonymously), and then editors or agents comment on what they think about the piece. Would they keep reading if it showed up on their desks? What did they like? What didn't they like? and so on. I've been to several of these types of programs at conferences, and the good news is they are very helpful to see inside the minds of the people whom we want to represent and publish our work. The bad news is these sessions are often brutal. The panel of editors and agents voicing their opinions on the "First Reads" are often like the American Idol judges. There's a Simon, there's a Paula, and there's a Kara/Randy. And the "Simon" editor ALWAYS winds up hurting some writer's feelings to the point where the writer doesn't want to attend the rest of the conference. So, I decided to write this blog for two reasons. One--as a warning--if you are a new writer or are very sensitive to criticism of your work, then you SHOULD NOT put your work in these types of sessions. The advice you hear on other people's work is still valuable, and you can learn from them. Go to a few conference or critique group sessions before you participate in a First Read. Number two is my larger point. As writers, we need to develop thick skin and a bounce-back ability because this career is hard. Even if you are the most wonderful writer in the world, someone isn't going to like your work. What's that cliche? You can't please everybody all the time, and that definitely applies here. 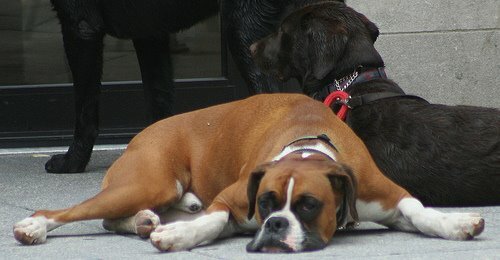 If you want to be a successful writer, you're going to have to learn to face rejection and criticism, pout for a while like our Boxer above, and then go wag your tail and chase your dream. If you are an American Idol fan, as I am, then I'll close with this. . .this season Adam Lambert is by far the best singer. He's favored to win more than any other contestant before, I think. On all the American Idol sites, he's what the commentators write about. I think he's great, and I can't wait for his performance each week. BUT. . .I'm sure we could easily find people who don't like him for one reason or another. They are rejecting him. Do you think Adam Lambert should go home and not attend the rest of the contest because of these rejections and criticisms? "Of course not," you say. "He would be crazy!" So, think about that the next time you want to give up when you're handed a rejection. Great post! I have three boxers and know EXACTLY what you are talking about. Writing IS hard. I've gotten better at writing short peices, but every time I start a story, I end up despising my main character, which causes me to abandon my idea. If anyone has any ideas on how to get past this, I'd love to hear them. Thanks, Margo, for this encouraging piece! What a great post and it combines my love of writing with my favorite show, which I just finished watching and cried when Scott had to leave. But you know what, he'll do well because he's one strong, kind man who doesn't give up. I attended a conference recently where a group of editors from children's publishers did a First Pages and I was relieved to see that they were kind, yet also imparted some seriously valuable information. One on one, I think it's important for an editor or agent to give a conference attendee good, strong advice (which can sometimes hurt!). That's usually in a private place, and you've paid money. But in a public venue like First Pages or First Reads, maybe it's better for editors and such to pick out the positive aspects. Aww cute pic. I belong to some poetry groups and there is some rejection and criticism there, but it's all good, all something to learn from.